The Dell Support Center tool helps you maintain your Dell computer in real time. However, if you have never seen or used this tool before, it can be difficult to understand. This is part 2 of a 3-part series on the free Dell support tool (now called My Dell). Here we look at using the most appropriate options to ensure your machine remains in good working order. We look at things like PC Checkup, Device Space Manager and some of the recommended actions your machine may advise you of, such as Device Driver Updates. Part 1 shows you how to download, install and load up the *latest version of the software tool (See Important Notice on page). Part 3 shows you other features of the software tool I think is useful for home users. Step 5 gives you the opportunity to share your experiences of using the Dell Support Center/My Dell. Did it help you to fix a problem? Did it cause you problems? Write your own personal web page by completing the form at the bottom of this page. Step 6 enables you to jump directly to the experiences shared by other visitors Take a look. You may find out something new! As software improves and evolves, so does the features and options included. As I am no longer in possession of a Dell computer, I am unable to update the images or additional options provided with the latest version of the My Dell software. However, please note the instructions provided in this article and interpretation of information is not significantly different from the latest software versions. I believe the information provided here is still a useful guide. We start by looking in more detail about what the Dell Support Center tool is and what it can do for you. 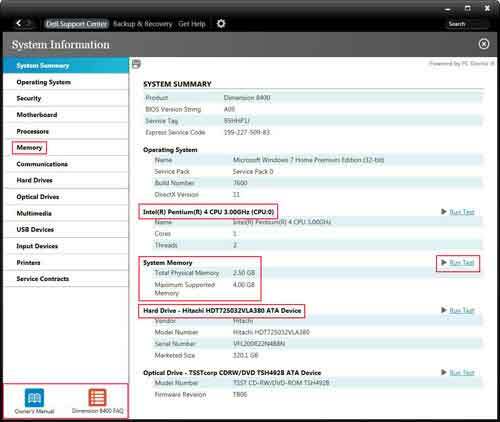 In this image, the Dell Support Center detects missing Anti Virus software. If you click this recommendation you are sent to the Dell website where you can review anti-virus solutions to install. An Internet connection is required to get the most out of this tool. Some of the options such as downloading user manuals or chat to a support technician send you to the Dell support site. If you click the Service Tag highlighted in the image above your web browser opens to the Dell services page. Here you can review your Dell contract and renew or take out a new contract if you want to. Do you need to spend your hard earned cash on a contract? Click the Detailed System Information Button. This shows you a lot of technical information about your PC. For example, you can determine things like how much system memory your machine has installed (Total Physical Memory), and how much more you could install (Maximum Supported Memory). More details about all your Computer Hardware Components such as your Processor and Computer Hard Drive can be found here. Some of the components have a Run Test option next to them. Clicking one of these options runs a specific hardware test for that internal component. For example, if you click the Motherboard link of the left hand side, then click the Run Test option, the software performs some basic checks on your motherboard and let you know if there is a problem or not. 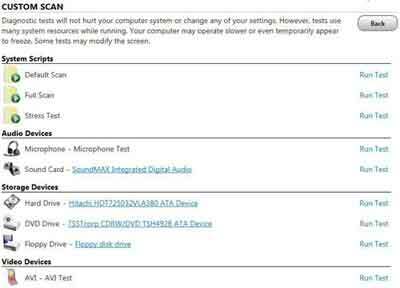 The option to test any component on your Dell PC is one you should try to take advantage of if you think you are having hardware trouble. Another handy link on this part of the Dell Support Center tool is in the bottom right hand corner of the System Information view. Click each link to read the user manual for your machine, or the FAQ link to help you to understand and troubleshoot your PC. You need to enter your Service Tag or your Dell Computer Model before you can access any meaningful information. Personally I prefer to use a search engine to determine fixes for the computers I support. I find they do a better job of finding answers to PC problems than searching within a computer suppliers web site. The next section looks in more detail at the PC Checkup option. To access the inbuilt PC Checkup option, left click the PC checkup button in the top right hand corner. You will see a screen similar to the image below. You have 2 scan options - Run Default Scan and Run Custom Scan. Click the Run Default Scan Button to run a full hardware scan on all of your Computer Hardware Components. It is in your interest to run a Dell Support Center default scan from time to time. This helps to ensure your PC is running properly. Are you concerned one of your hardware components is not working properly? For example, if you suspect your motherboard is having problems, you can select the Run Custom Test button and select the specific test to run. Click the Details button after the test is completed. This provides additional information on the test performed. As a home user you don't really need to worry about this option. There are two additional options in PC Checkup that is worth quickly looking at. 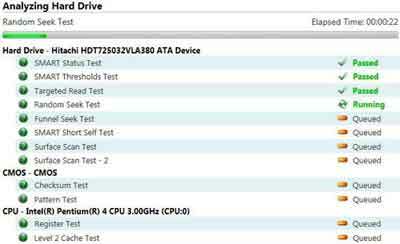 The Drive Space Manager and the Performance And Configuration History. Drive Space Manager scans your hard disk and presents a pie chart with a breakdown of disk space used by programs, videos and other file types. It also shows how much free space there is. When you select a file type, it displays all the files on your PC relating to that file type. For example, if you click the Video tag, it displays all video files on your machine. This is helpful when deciding which files to delete from your computer when performing some basic house keeping. 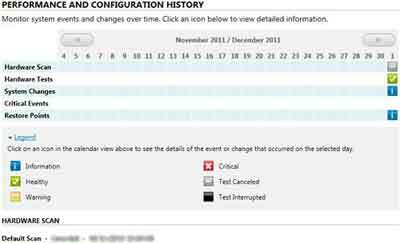 The Performance and Configuration option shows you the day when specific tests were performed so you can track the changes in test outcomes over time. This is helpful to identify when problems first started. You may be able to trace problems back to the installation of a new hardware component, or a change in device drivers. Click the Legend link to display the details. I hope this discussion about the Dell Support Center software is helpful to you. The tool has lots of features to make your computing experience much richer. Part 3 of the tutorial series shows you some other features such as the Scheduled Hardware Scan, Hard Drive Status and Dell Help And Alerts. If you want to learn more about troubleshooting Dell computers, go to the Dell Support site (Opens New Window). What is your experience of the Dell Support Center tool? Does it help to maintain your Dell computer? Has it caused you nothing but problems? Enter Your Title e.g. "Dell Support Center - Time Saver!" Click on the links below to see what other visitors to this page have written about their Dell Support Center experiences.